The cashmere slippers from Quinn treat feet to super-soft, cozy warmth in the most luxurious way possible. They are made with pure, first-grade cashmere sourced from goats raised in inner Mongolia, a world-renowned region for ultra-soft cashmere. Wear a suede-soled pair around the house or they can pack up easily to take along on trips. Dimensions: S/M: 10.25" x 3.5" x 2.5"; L/XL: 11.5" x 3.75" x 2.5"
The cashmere wraps and cashmere slippers from Quinn are an extra special way to elevate the everyday—even when you’re on the go. The accessories are made from pure, first-grade cashmere sourced directly from farmers raising inner Mongolian goats. These goats are renowned for making the super-soft, lush cashmere that comes from this region. The lightweight wrap can be worn any-which-way, like as a shawl or a scarf. We think it works equally as well as a great get-cozy-on-the-plane piece, or as a warm finishing touch on just about any look. 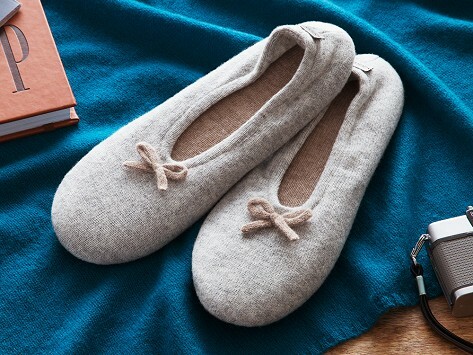 The suede-sole cashmere slippers give you luxurious comfort at home and keep feet toasty warm. Touch the wrap and the slippers and you’ll instantly feel the premium quality. One makes for a stand-out gift or a treat-yourself indulgence you’ll reach for over and over.